The horizon of the Colorado Rockies is a landscape so utterly majestic; a seemingly infinite series of mountains that tower above our petty civilization and beckon for us to come explore. Acting as an east-west barricade, the high mountain spine of the Continental Divide holds some of the most epic rides in the United States. Most people only experience the Colorado Rockies as the backdrop of a gorgeous photo or as an endless array of snow-capped peaks along the horizon. Unsatisfied with simply looking at the soaring pillars, Jeff Nussbaumer, 46, set out to traverse the backbone of the American west through Colorado, while attempting to stay as high as possible. The idea transitioned into a 7-year adventure, with more than 130,000 feet in elevation gain and the eventual publication of a guidebook, "Ride Along the Divide." Growing up as a country boy and riding around Minnesota's lakes was just the beginning. Jeff's early flirtation with mountain biking and an eventual move to Colorado launched him into a head-over-heels romance with the sport. "It isn't the technical aspects, or speed that I love, but rather the challenge of reaching a highpoint with that kaleidoscopic view." That state of mind pushes Jeff through countless hours of labored breathing, across high mountain rock, tundra and snow. The nearly palpable clouds, breathtaking panoramic expansions and gumption of self-accomplishment ultimately drove him to chase after a new extreme route. Jeff soaking in the views atop Pearl Pass (12,705′). The Great Divide Mountain Bike Route is well known across the adventure mountain biking world as a premier off-pavement route that crisscrosses the Continental Divide, passing through Colorado on a north-south journey from Banff, Canada, to Antelope Wells, New Mexico. While riding parts of this route in 2005, Jeff wanted to go higher, for longer. Indiana Pass at 11,910 feet above sea level in southern Colorado (the highest point on GDMBR) provided just a glimpse of potential that a truly "high route" could offer. The idea of Jeff's Ride Along the Divide (RAD) sprung from there. Navigating the precarious and rocky ridges while avoiding as much paved and 4-wheel-drive dirt roads as possible became his new goal. With a two-wheeling mania gripping his heart, Jeff set out from northern Colorado with his front wheel pointed south. He intended to make it from Wyoming to New Mexico across the spine of Colorado while following a rough itinerary mapped out on the green and grey glory of topographic maps. "Maybe this dates me, but I didn't want to use a GPS or anything like that." Jeff's first bike was not tricked-out with fancy gadgets. It didn't have extra large wheels or additional suspension. Instead, Jeff rode a vintage Trek 860 7-speed. "I dragged my bike through countless sections. It didn't handle well on the rough jackhammer-like chunks of downhill. My next bike was a Trek 4600. I retooled the whole machine, which worked well for the next couple years." Jeff's full time job as a juvenile correctional officer limited his schedule. 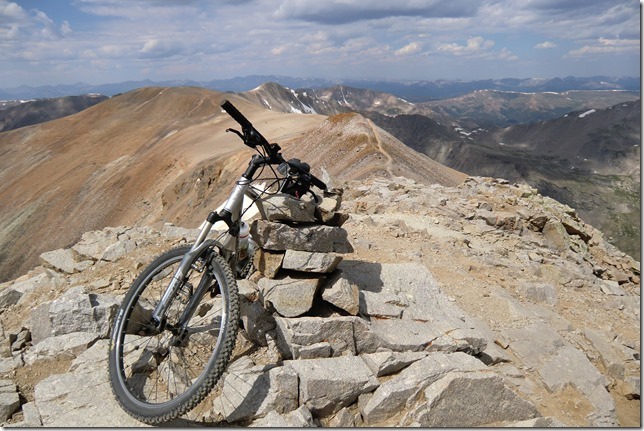 The extended multi-week long segments of high alpine riding would have to be broken up. Jeff seized the long weekends and any extra day to hit the trail, picking up where he left off the ride before. A backpack, a seat bag and the remaining items jimmied under his seatpost offered him a simple and lightweight combination. His bike maintenance tools, a first aid kit and essential miscellaneous items shared the limited space with dried fruit, nuts and protein energy bars he ate for sustenance on multi-day segments. Jeff jokes that the convenience of the route he chose was the frequency of small mountain towns where a monster burrito was inevitably available. As time permitted over the next seven years, Jeff completed the route from Grand Encampment, Wyoming, (138 miles west of Cheyenne) to Chama, New Mexico, with a collection of friends as company. 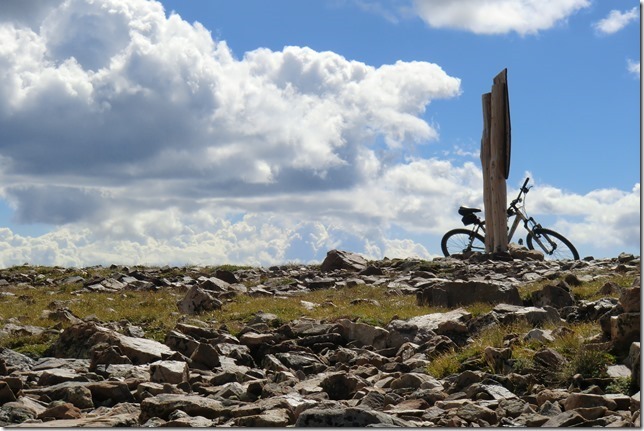 Nothing but an endless sky above Mosquito Pass, in-between Leadville and Fairplay/Alma. Along the journey, he accumulated an abundant collection of stories that his friends encouraged him to write down. The attraction of documenting the journey and sharing the endless possible trails of the Colorado landscape appealed far more than a personalized memoir of sorts. The "Ride Along the Divide," a section-by-section guidebook of "Colorado's most radical all-terrain mountain bike route" emerged. In addition to a grand traverse of the Colorado Rocky Mountains, the guidebook details other options, both easier and more difficult, that split off the main trail. "There are more trails out there than I can see in a lifetime. This is just a fraction of what Colorado offers." Throughout the guidebook Jeff seeks to mitigate the tensions that exist between cyclists and hikers on section of trails, in addition to celebrating the alliance and mutual affinity to the landscape held by both parties. "Hiking associations have history, longevity and are well-funded, while bike associations are not. They are emerging into a new space previously unoccupied by the two-wheel type." Jeff hopes that with enough time and effort, hikers will understand the similarities between the two. "Bikers are more like hikers than ATVers or jeepers. We are no more environmentally impactful than hikers." 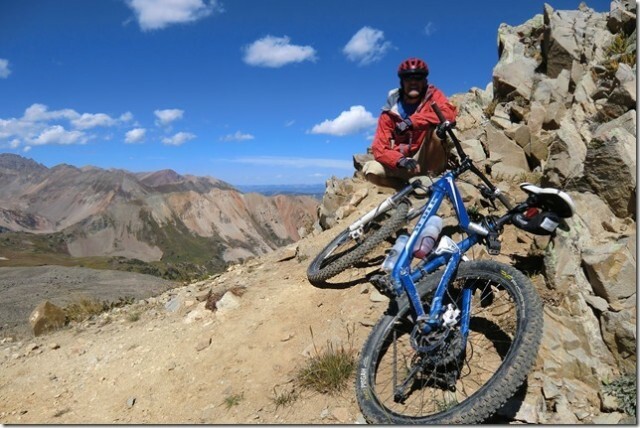 Jeff believes that hikers and bikers can share trails like the ones he so passionately rode and wrote about. Summit of Mt. Lincoln (14,295′). Jeff's approach to mountain biking is anything but typical. Exposure to the nastiest elements for days on end isn't everyone's idea of fun. For Jeff though, "reaching the mountain summit on my own accord, leaving my footprint and personal expression on a place overlooking the breadth of the Rocky Mountains is my connection with god." When asked if he would go back and do it all again, Jeff's answer was a resounding yes. "There are always things I'd like to perfect – lessen the pavement sections, explore new trails, find new ways around the wilderness." But ultimately, "my kids are teenagers and I'd love to go with my son one year, before I get too old to turn the pedals anymore." The seemingly prophetic connection with nature and oneself drives Jeff. "I love the trail, nature and mountains". RADTreks is a blend of all three. "I'm not an expert, but definitely an above-average rider," Jeff says. For him, the ride was 80/20—80 percent is rideable with the remaining 20 percent best suited for hike-a-bike. Depending on a rider's ability, quality of his or her bike, and various conditions, this number shifts, yet Jeff remains confident that the entire thing could happen in a month. "Plan way ahead," he emphasizes. "Don't underestimate the amount of work involved." Strategically planning stops and convenient resupply locations is just the beginning. Optimal fitness and equipment ensures that you get from start to finish in one piece. More information about RAD can be found online.